No matter how many times you’ve heard it in pubs, being played out of car windows and online, it turns out that football is not coming home after all. England’s chances of glory in Russia were ended by Croatia who booked their place in their first ever World Cup final. Despite going the distance in each of their knockout stage matches leading up to the semi-final, Croatia actually got stronger the longer the game went on against England. Their midfield used the ball very intelligently while England struggled to cope with the movement of Croatia’s forward players. Still, being forced to go to 120 minutes for a third match in a row presents Zlatko Dalic’s men with a real challenge in the final against France. France kept their fourth clean sheet of the World Cup in their 1-0 semi-final victory over Belgium. Some Belgium players were so unhappy with the nature of France’s performance that they went as far as to say it was ‘anti-football’ but Deschamps will not care one jot. He’s batted away critics of his style of play and to become just the fourth man to reach the World Cup final as a player and manager. The bookies all make France the odds-on favourites to lift the World Cup but Croatia have shown they are not a side to be underestimated. It may lack some of the prestige of previous finals but the 2018 World Cup final should be an intriguing encounter. 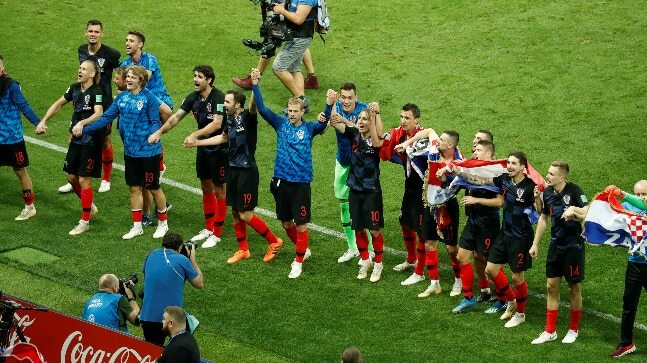 Croatia celebrate after their win over England. It is hard to fire on all cylinders consistently through the World Cup. You only have to look at big teams like Germany, Spain and Brazil who all fell well short of expectations to see why performances come a distant second to results in terms of importance at the World Cup. So, while some France fans were complaining about Les Bleus’ narrow in over Australia and the bore draw against Denmark, Deschamps was solely concerned with his team doing enough to keep on progressing. Similarly, Dalic would much have preferred it if his team could beat Denmark and Russia without having to rely on penalty shootouts but his main concern is that Croatia kept progressing through the rounds towards the final. Croatia’s battling spirit suggests to us that they will not be easy to beat, even if France are the superior side. Ultimately, the extra quality in the French ranks should make the difference but rather than backing them to win in 90 minutes, take the slightly safer option of betting on France to win the World Cup at 5/11 with Unibet. For a bigger potential payout, France look a good price to win in extra-time at 8/1 with Coral as their pace and trickery in pace should see them create chances against tired legs in the Croatia defence. The bookies’ odds in their Correct Score and Over/Under 2.5 Goals markets suggests that they are expecting a very tight game. The defensive strength that both teams have shown so far would back up those expectations but we don’t think the game is going to pass without incident. France have a settled front three of Olivier Giroud, Antoine Griezmann and their star forward, Kylian Mbappe. Croatia aren’t quite as talented in attack but in Luka Modric and Ivan Rakitic they have midfielders capable of creating chance after chance so we’re expecting a goal for each side. Given that we think there is every chance that the 2018 World Cup final will go beyond 90 minutes, the 1-1 draw appears well priced at 6/1 with Sportingbet. Olivier Giroud is desperate to score his first goal at the World Cup in Sunday’s final. Olivier Giroud has won many fans for his hardworking performances up front for France. Unfortunately, he’s been unable to back up his impressive link-up play and tying down of centre-backs with any goals. In fact, Giroud is yet to have a single shot on target in Russia but that may be about to change in the final. Giroud is a danger from set-pieces and is one of the best attacking headers of the ball in the world. 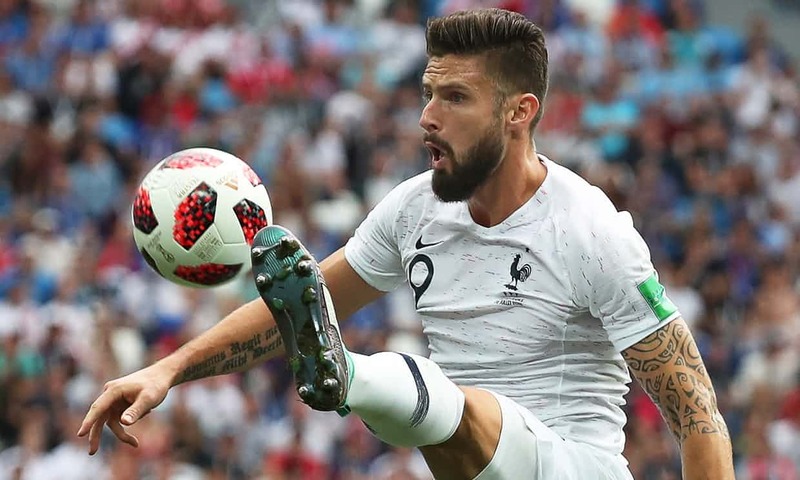 With France’s quick players likely to have some joy down the flanks, Giroud could well get on the end of a cross and open the scoring at 11/2 with Ladbrokes.